Nine Algonquin First Nation chiefs who asserted Indigenous land rights to the sacred site Akikodjiwan in 2015 will be meeting with the National Capital Commission (NCC) on Feb. 5, 2016 in Ottawa. The meeting was announced in a press release from Wendake, territory of the Wendat Nation. 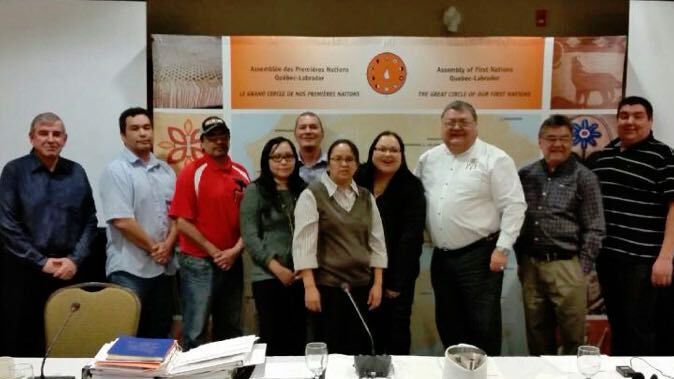 It follows support for the chiefs’ position by both the Assembly of First Nations—Quebec Labrador and the national AFN body of chiefs, both of which passed resolutions in late 2015 calling for nation-to-nation talks with the legitimate Algonquin First Nations opposed to the Windmill condo project in the Ottawa River. This photograph shows the nine Algonquin Chiefs and Grand Chief of the Algonquin Anishinabeg Nation Tribal Council during recent talks in Wendake.